Invited to consider how a work could reflect, respond to and develop alongside the passing of time and the seasons, artist Christian Kerrigan presents the second half of a two-part exhibition. 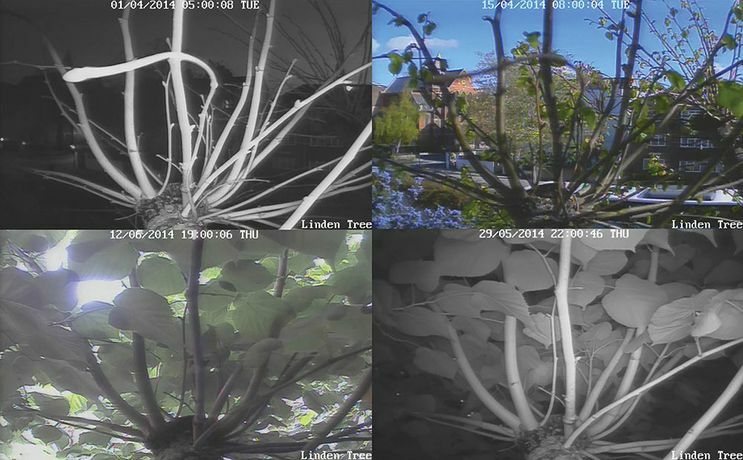 Using live CCTV recordings from the past six months of the Linden tree growing outside Siobhan Davies Studios, Kerrigan reflects on the development of the tree's lifecycle, from the sparse branches in winter to the dense, leafy foliage in the summer months. Mixing the recordings with computer game software, Kerrigan creates interactive film footage for the viewer to explore. A single tree branch captured within London's busy environment initiates a story of light, pollution, microclimate, transport and migrating wildlife. The footage sits alongside Kerrigan's large-scale sculptures which play with processes shared by nature and technology and chart the progress of the seasons from spring through to autumn. This exhibition is part of Human-Nature, a programme of exhibitions and events exploring the interdependent relationship between people and plants.